Lucky for us bunny owners, rabbits are very clean animals by nature and don’t need baths or much grooming to keep them looking their best. Learning to cut a rabbit’s nails the first time canbe trick but stick with it and you’ll be trimming away in no time! 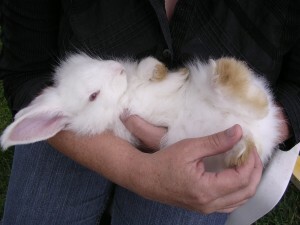 Trimming your rabbit’s nails is one of the basic grooming techniques that will ensure that your bunnies are kept in tip-top shape. This is the one thing that needs to be done on a regular basis to keep you rabbit’s feet happy. Using regular human toenail clippers or special animal nail clippers (available at any pet store mega mart) is all you need! I also like to keep a small container of corn starch handy to stop any bleeding if I clip the nail too far back. 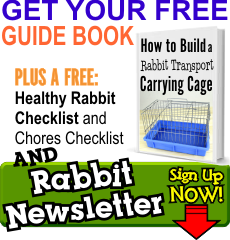 Start by taking your rabbit out of its cage and take it over to a chair or sofa. Have a seat with you bunny in your lap, their head facing away from you. Pull out a front paw with your hand and look at the nails. There will be five nails on each of the front paws and four on each of the back paws, total of 18 nails to trim. Look at the first nail on the paw and find the quick. The quick is the line of blood running from the nail bed into the nail. If you’re rabbit has white nails this red-section will be very easy to see. If your rabbit has dark nails you might have to hold a flash light up to the nail to see where the quick starts. When you cut a rabbit’s nails you do not want to cut into the quick so pick a spot about a ¼ inch up the nail away from there and clip it off with your nail clippers. Continue around until you’ve trimmed all the nails on your rabbit. If you do accidentally hit the quick you can dip the nail in the corn starch to cause the blood to clot faster and stop the bleeding. Enlisting a friend or family member to help may be good for your first few times trying this. That way you can hold the rabbit and the rabbit’s paw and your helper can go around and clip the nails. 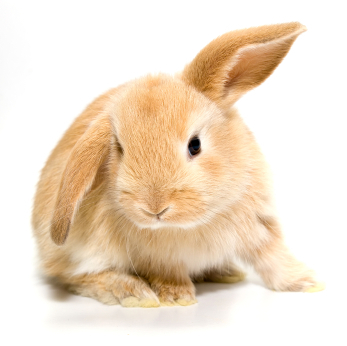 Trim your rabbit’s nails when ever they start to grow about 1/2 an inch to 1/4 of an inch past the quick. Keeping these grooming will make it much safer for you and your bunny to play together and enjoy petting time. This will also keep your rabbit from accidentally breaking nails that get too long, which can lead walking problems, bleeding and possibly infection.